1. This Tribunal [ICT-2] took notice of the editorial published in the New York Times [Muzzling Speech in Bangladesh By THE EDITORIAL BOARD DEC. 23, 2014] by its order dated 28.12.2014 together with the news item published in the daily Prothom Alo, 20 December 2014, page 2. 2. Both involved criticism on the decision of this Tribunal convicting a journalist David Bergman for the offence of contempt under the provisions of the International Crimes (Tribunals) Act 1973. The news item published in our national daily relates to ‘statement’ made by 49 citizens expressing their concern on the matter. Already they in compliance with the Tribunal’s order have furnished explanation in respect of their conduct expressing ‘apology’ and ‘regret’. Those have been kept with the record for further order. 3. 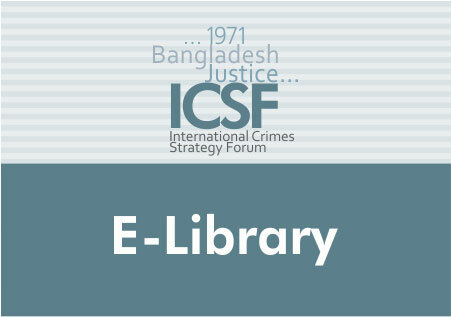 It appears that the core content of the editorial published in the New York Times [Muzzling Speech in Bangladesh By THE EDITORIAL BOARD DEC. 23, 2014] constitutes a classical example not only of endorsing a punished contemnor’s conduct who found guilty for the charge of scandalising the Tribunal a lawfully formed judicial forum --but the view expressed in the editorial tends to demean the judiciary of a sovereign country, Bangladesh, prima facie appears. 6. In view of above, at this stage we deem it expedient to have explanation, if any, on part of the New York Times for the unwarranted and derogatory comment it made in its editorial titled ‘Muzzling Speech in Bangladesh’ published by the Editorial Board Dec. 23, 2014 to dispose of the matter analogously with that related to the ‘statement’ made by 49 citizens published as a news item in a local national daily..